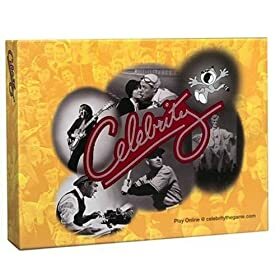 Celebrity is a descriptive trivia and charades game that will have you seeing stars. It’s appropriate for the entire family, as YOU supply the subject matter. Celebrity comes with a personal-sounding and funny set of instructions, complete with stick figure pictures. Abbreviated rules can be found on the back of the sturdy Score Cards, which I found to be easier to understand than those listed in the full manual. The main and most important rule to remember in Celebrity is that you can “never, ever, neverEVER” (as the game says) let the name or part of the name of the star in question slip, otherwise what would be the point. Play is comprised of three rounds. After dividing into two teams, one V.I.P. holds the two Score Cards behind his back while another person selects one at random. This decides who goes first. Shuffle the Celebrity cards well, then distribute 5-8 of them to each player. Each participant is to fill in his card categories with appropriate famous people using an erasable pencil. The categories include: Historical Personalities or Newsmakers, Movie or TV Stars, Music Bands or Stars, Famous Animals or Cartoon Characters, Sports Stars, and Author or Literary Character. I like how there’s a wide range to pool from. When everyone’s done writing on their cards, have them put them in the Celebrity grab bag. Each round consists of one-minute mini rounds in which the teams go back and forth having a player draw a card and communicate it to their partners. In Round One, any form of description can be made, except for the obvious giveaway of things having to do with the celebrity’s name. In Round Two, a contender may only supply two words – and two words only – to describe the star on the card. If the Literary Character was Alice in Wonderland, for example, maybe you would say “Eat Me”, or for Tony the Tiger, why not “They’re grrreat!”? As for Round Three, it’s your turn to be an actor yourself and charade your way to victory. Make like a silent movie and have no words or sounds allowed (no subtitles, either!). At the end of the three rounds, it is the team with the most points that is going to Hollywood. I think it’s really good that in the game of Celebrity, you write in stars that you know rather than have to fumble with ones you’ve never heard of (although the game does provide an extensive list of suggestions if you’re stumped). The game provides variation ideas like doing star themes. It’s a good game for lovers of Charades who are at least moderately interested in celebrities. As far as the negatives go, I want to know why the game requires that you go through all of the cards in the grab bag for each round. Not only is this time-consuming in large groups, but it makes for too-simple game play in subsequent rounds, once you are already aware of all the celebrities in the bag. If you play with someone like your spouse, you may wind up writing down the same celebrities, or be able to guess the stars your partner picked quite easily. If you find celebrity news to be more entertaining than the real news, or simply admire or look up to some famous people, then the Celebrity game could be ideal for you. If you’ve never desired to be Mrs. Johnny Depp or Mr. Angelina Jolie, however, this venture will strike you as so-so.